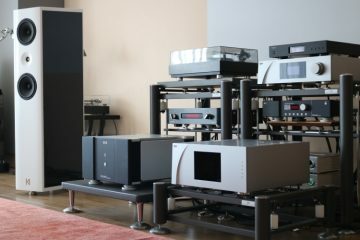 Esoteric is a brand with a huge reputation in the field of transports and CD players, and quite deservedly so. They also issue preamps, power amps and DA converters, but somehow these components seem to be less known. 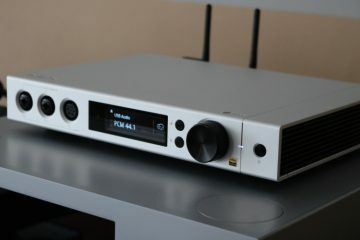 The D-07 DAC has been around for 5 or so years and has now been superseded by the N05. Still, with time moving so fast, and my clinging to DACs much older than this, the D-07 comes across as being relatively very recent. 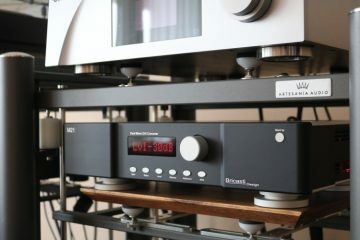 The D-07 closely resembles the more elevated esoteric components, but has simplified electronics and casework to save costs, and arrives at a more friendly 5000 euro mark. Inputs are AES/EBU, 2x coaxial SPDIF, 1x Toslink SPDIF and USB. There are also a TTL-compatible word-clock input and output. Outputs are both XLR and cinch. 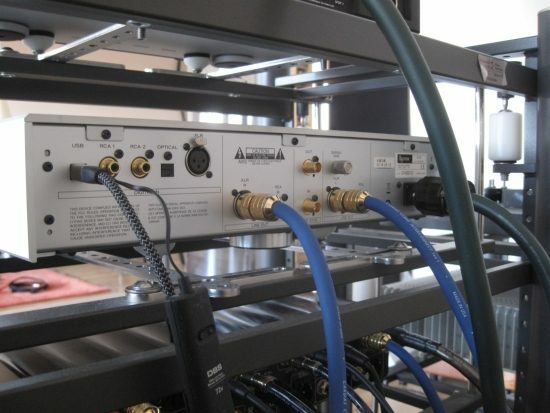 Via a menu you can select various options, for example Polarity, Linear-phase digital low-pass filter (called FIR) or Minimum-Phase, Apodizing type (called S_DLY), No upsampling (Conv Off), or Upsampling in several stages up to 1-bit, 64Fs DSD format and Single- or dual-PLL input operation. For DA conversion, each channel uses one AKM 4392 IC. This 32-bit converter has differential outputs and can decode both PCM and DSD data. For the purpose of this review, I only listened to PCM. There is no IR remote, but as I understand it, any remote from an Esoteric CD player will work. Expecting the Esoteric to sound quite bold, the first power cable connected was a smooth, but very detailed sounding Furutech FP-TCS31 with FI38/FI28 connectors and this was an immediate hit. There are not many power cables that sound more fluid or creamier than this cable, nor is it easy to obtain higher resolution without spending multiples. There are however faster and more articulate power cables, but as will become clear, it seems that this is not required for the Esoteric. 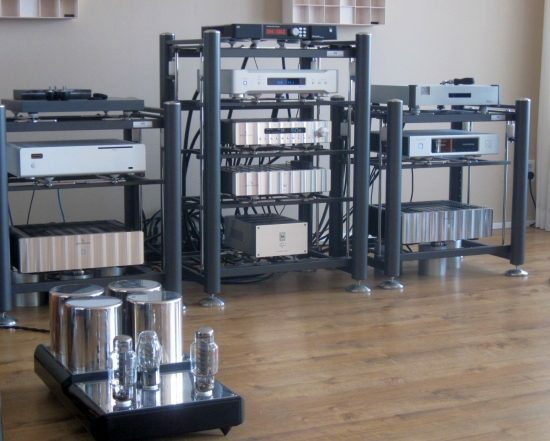 Interlinks used included the Black Rhodium Concerto XLR as well as the Cardas Clear XLR. The Black Rhodium nicely accentuates that Esoteric’s inherent qualities, making for an even more powerful yet still very neutral delivery while the Cardas extracts more refinement and air from the DAC, while instilling some more fluidity. This could be said is the more audiophile delivery but somehow though I found the Esoteric-Black Rhodium combination also very addictive. First thing I investigated was the influence of the various menu settings. Oftentimes in the past I have preferred minimum phase filters, mostly for their more natural sound which fitted my then analytical systems better. These days with my smoother setup, I tend to prefer the linear phase filters. At least, this was the case with the Esoteric as well as the Bricasti. You lose a bit of soundstage depth and the sound becomes relatively more square, but the delivery is also more powerful and direct. Upsampling provides precisely what you would expect: with each setting a stepped increase in treble refinement along with a subtle rounding of transients. While I would have chosen 4x or DSD upsampling with my previous setups, I now preferred the no upsampling setting, which made for the most Wadia-like bass and lower midrange. 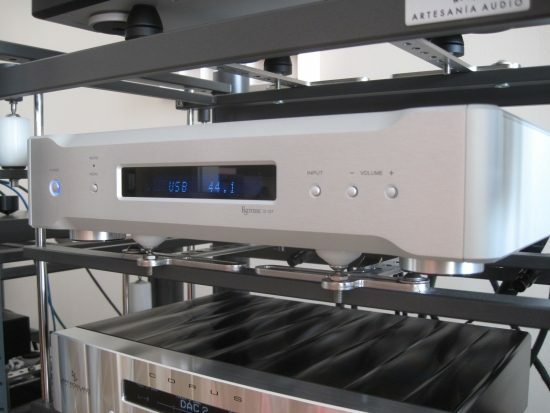 By that I mean that the DAC sounds most beefy and solid, but also most resolute, which is what my Apogees love but not necessarily the best setting for more forward or analytical sounding systems. 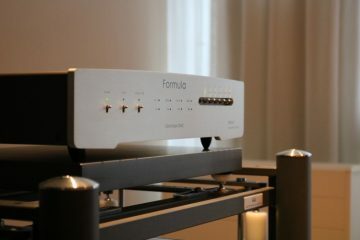 Indeed listening to the D-07 via dynamic speakers such as the Marten Mingus Quintet, Dali Ikon 6 and Sonus Faber Amati Anniversairo, the D-07 sounded most pleasant with a little updampling and I imagine that many people will prefer 4x or DSD upsampling as this not only smooths things out subty but also increases the perceived resolution in the treble. The phase lock loop settings also prove interesting. While using 2 PLLs would seem to be the best choice, I found that the DAC tips over into sounding overly controlled that way and I preferred the single PLL. As always, your mileage may vary, and the options are all there to try. 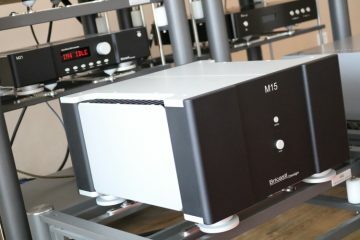 Simultaneously over for review were the Bricasti M1 Classic as well as the Matrix X-Sabre Pro, providing meaningful comparisons, besides the Exogal Comet and my ageing Wadias. Compared to the Matrix X-Sabre Pro, the difference is very large, not necessarily in absolute sound quality, but in presentation. The Esoteric does not uncover new worlds of detail, but where the X-Sabre Pro sounds a bit polite and restrained overall, the D-07 has a much bolder presentation, it is a lot livelier, and quite a bit more engaging for it. The Esoteric’s midrange is very vidid and highly communicative, but without any sharpness or edge. 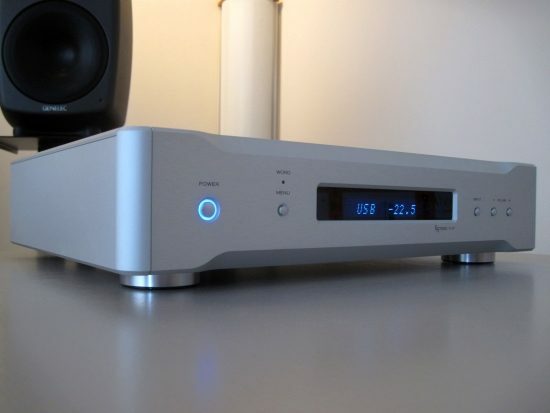 The Esoteric presents music with real gusto: theres a bold and focused power to its delivery, making for a very solid and upbeat sound not unlike the typical Wadia delivery. 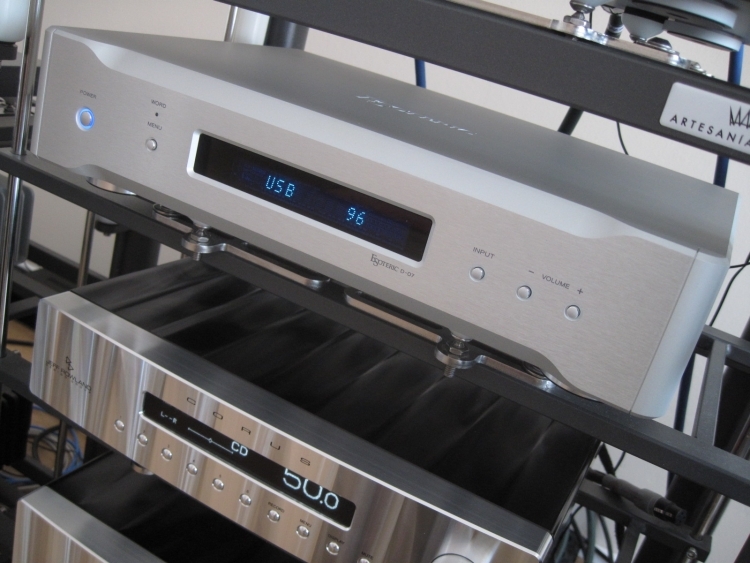 This is not a super-polished, typical Japanese sound, and I commend the DAC for it. Not only does it work splendidly in my main system, it also works wonders with the Genelec 8050 active speakers in my media room setup. 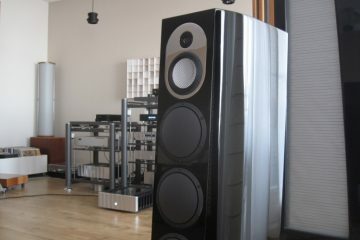 Compared to the Exogal Comet that is normally connected there, the Esoteric sounds more powerful and sonorous, making the somewhat clean sounding Genelecs sound timbrally fuller and more acoustically convincing. The Exogal on the other hand sounds more refined and has an overall more gentle and airy presentation. In this sense, the Exogal sounds more like what I have come to know as a typical Delta/Sigma delivery, while the Esoteric positively deviates from this by sounding almost like a more typical multi bit DAC. 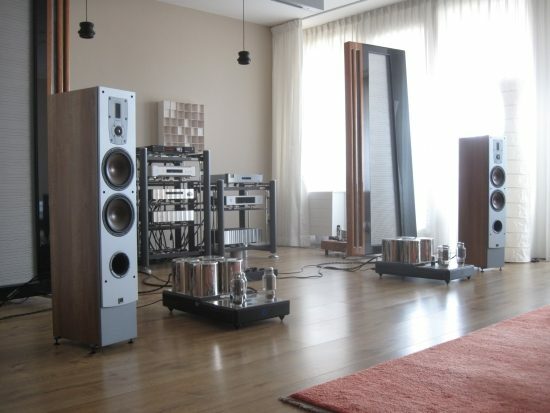 As always in matters audio, things are quite relative. 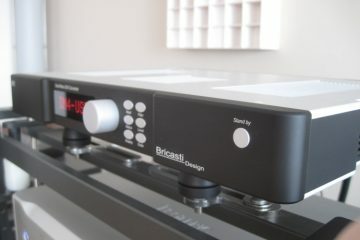 The Bricasti M1 is a very different animal than the Esoteric, having almost chameleon-like qualities. The Bricasti is master of nuance, detail and dynamic differentiation, but being a gentleman, it will never shout for attention. Conversely, the Esoteric with its more bold and concentrated sound is quite happy to impose its own character on the music, and this character has to fit the system in which it is used. 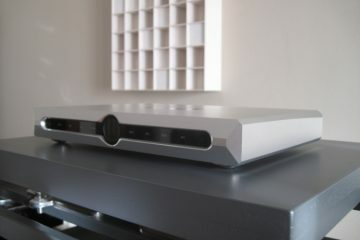 For example, it works very well in my main Apogee Diva system because this system has an inherently smooth and relaxed presentation. 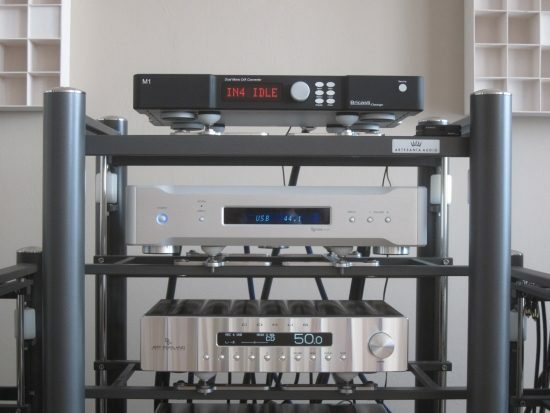 In this setup I normally use a Wadia 521 DAC which fits very well for the same reasons that the Esoteric does. 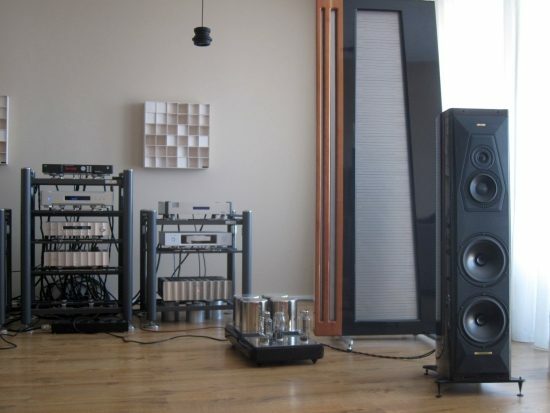 Between the two there are more similarities than differences, ultimately coming down to the Wadia having the edge in terms of sonority, soundstage width and timbre, while the Esoteric is a little bit more transparent and upbeat and has the benefits of altering its sound using the various menu options, ranging from a solid and resolute sound to a sound airier and more friendly sound than typically attained with Wadia DACs. All this talk about solidity, sonority and power could easily lead one to believe that the Esoteric D-07 may be too clinical or too controlled for its own good, but this is definitely not the case. The D-07 actually sounds highly lyrical and involving and it has a huge foot-tapping factor. While I would not describe the D-07 as being typical “analog” sounding, it is also not typically “digital” to my ears. On balance I’d say that it is bold and powerful, a little dark, and quite direct, but highly involving and very musical. My inherently relaxed sounding system seems to effectively embed these qualities, leaving only a super-engaging, classic Wadia-like sound. 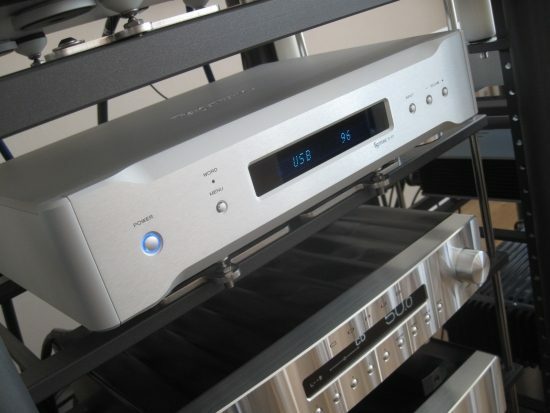 If your system can take some spicing up, then this DAC may be the perfect choice. The extra benefits of course are in the various filtering and upsampling options, which provide meaningful fine tuning. 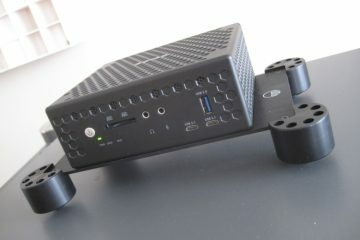 Can you please describe the D07 soundstage: layering, focus, etc. 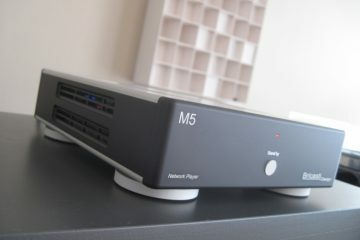 As commented time ago I am looking for a DAC to replace the Accuphase board DAC 40 on my E460 integrated amp & PMC 26 in order to open the soundstage. 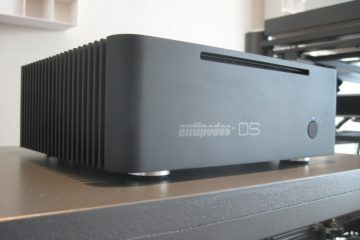 The short answer: the D07 is not for you if you want to widen/deepen soundstage coming from a DAC40. Thank you Christiaan. 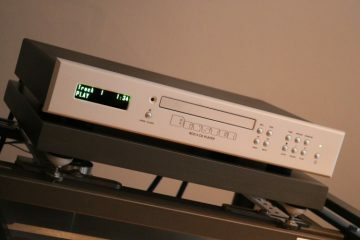 Luckily I have found the root cause for the “compressed soundstage”, I will comment on your Accuphase review.